As the new academic year gets underway, I’ve been thinking about the intersection between learning outcomes and assessment. In several posts, I will use examples from intercultural communication to illustrate some basic assumptions about culture and learning, and suggest ways to proceed. As instructors we noticed that the Hymes framework helped students to make initial observations about a way of acting (A). Upon reflection, I now recognize that they needed another way to articulate how this one observation fit into a larger cultural context before moving to evaluate if the observed behavior was good or bad. Carbaugh (2007) provides one such framework. To abbreviate [and change the steps slightly], he advocates that learning about other cultures begins with observations that lead to descriptions: what do you notice? After detailing the observation, one can compare the observation to other cultural practices that are known (often one’s own culture can serve as an initial basis for comparison). Following the comparison, one can start to inquire about the broader context within which the noticed behavior is a part. The social and cultural context that frames any one particular behavior helps us to understand how any given behavior can make sense, or be interpreted from the perspective of the people enacting that behavior. Finally, one can evaluate whether that behavior is valued or not within the given culture, as well as how it might be interpreted and valued or not within the comparative culture. Let’s apply this to the slipper example above. First, U.S. study abroad students notice that Finnish elementary students wear slippers in class. They may notice this initially due to a comparison with their own experience: when they were in elementary school in the U.S. they did not wear slippers. Rather than jumping to the evaluation from the perspective of the comparative culture (that it is better or worse to wear slippers to class), they need to learn about the larger cultural context. Of which environmental and social factors is this behavior a part? In this case, the heavy winters and the value of playing outside for recess suggest reasons associated with the place where they are living as relevant to the interpretation of this practice. Because outdoor shoes would carry snow and slush into classrooms, they provide an area to stow outdoor winter-wear and don alternate indoor footwear, such as slippers and lighter articles of clothing. Recognizing these circumstances, the students would then dismiss any initial hypothesis that the teachers are more lenient than those in the U.S. This example of intercultural discovery can serve as an analogy for outcomes assessment. When we are constructing a course, we may have a number of outcomes we hope students will achieve by the end of the course. In order to get to those outcomes, it might be useful for a student to recognize how those outcomes are different from current practice. The practices students bring with them to the classroom are based within particular cultural contexts. In order to demonstrate a new practice that is highly valued by the instructor, a student needs to begin to recognize the larger context within which this new practice is a part and within which it makes sense to engage in this new behavior. In the next post, I will describe more about ways to create outcomes and assessments for intercultural communication. I moved to Bangkok, Thailand in January 2013 to earn my master’s degree as a full-time student at Webster University Thailand. I needed to find work to support myself. After two months of hunting, I landed a job at a private language school teaching English, something I was qualified to do as a TESOL-certified American with two years of previous overseas ESL expertise. Having never taught Thai students before, I initially struggled to satisfy their learning needs. The students expected me to teach by talking; they wanted to participate as little as possible. My boss told me that, unlike American students who take an active role, Thai students are often quite passive learners. Classes were mostly one-on-one, a new format for me. A few lessons were cancelled after students griped about my teaching methods, disliking the fact that I was following the textbook lesson plan precisely rather than teaching from my knowledge of the topics and using the book minimally. I started out teaching academic writing and grammar to adolescents who found the material dry; thus my challenge was to make it more interesting for them. Really, I had no lessons in technique: my busy boss usually gave me the necessary resources to teach and then left me to figure out the rest on my own with minimum advice. So, after nearly a month of floundering to improve my teaching performance my boss decided to give me a two-month hiatus (although I did not know this at the time). It turned out she was right: I needed more time to adapt to the culture and the students. A few months later, I was called back to teach a new academic writing class for a mid-career professional who wanted to return to school. This time I brought my computer with me, using the Internet as an aid to my lesson plan. I prepared PowerPoint presentations to convey the material in an engaging and orderly manner. Throughout the two-month class, we managed to build rapport and exchange cultural knowledge that helped us to understand one another as individuals. “Here are pictures of my Buddhist monk ceremony, a rite of passage that many Thai men experience,” my student shared with me one day. In return, I showed him a student newspaper from my college days. “This is my pride and joy as former editor-in-chief of the paper; you can learn about my culture through this medium,” I told him. It was one of those cultural insight moments I cherished. As our class progressed, he gave my boss positive feedback about me – and my confidence in my new techniques improved. I was not only the first American, but the first African-American teacher this school hired. I have now taught students from Bhutan and Russia as well as Thailand. This experience has taught me the values of patience, flexibility, humility and effective cross-cultural communication. Teachers can make a difference in students’ lives, especially in cultures that are drastically different from their own, but students also make a difference in their teachers’ lives. They learned some English, but I learned about their cultures. Creating a comfortable space for students to be themselves, and remembering that teachers also learn from their students, can foster wonderful intercultural dialogues. Charles McKinney is a recent MA media communications graduate from Webster University Thailand. Having embarked on a rewarding career of ESL/EFL teaching as an expat in East Asia, Charles is hoping to secure an English Language Fellowship with the US Embassy for the new school year and is making plans to possibly join the Peace Corps next year. CID’s website was helpful during Charles’s master’s thesis research, and he wrote this essay as a way of giving back. Contact him through LinkedIn. Ah, cosmopolitanism. 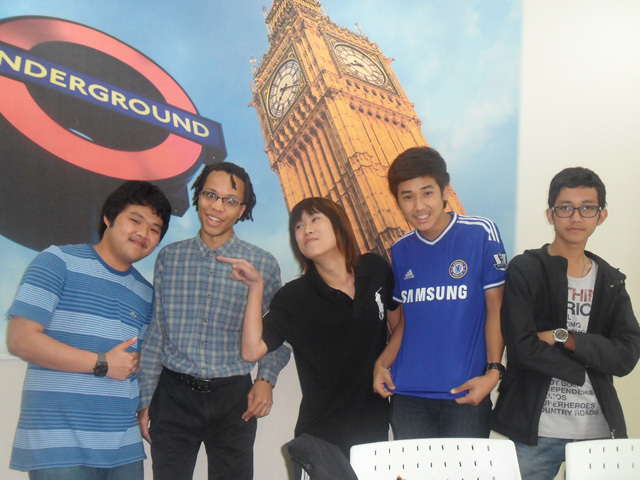 The first time I found you, I was taking a class on global and transnational ethnography with Dr. Takeyuki Tsuda. I read an article by Ulf Hannerz titled Cosmopolitans and Locals in World Culture. He has since retracted many of the things he wrote in this article. And yet, for the first time, I felt that I had read an intercultural theory (in an anthropology class, no less) that actually applied to my life. So much of the work I’d done up until this point examined intercultural theories that provided dichotomies. You were EITHER individualist OR collectivist. When you travel, you EITHER make friends from your home culture OR your host culture. You are EITHER a patriot OR an interculturalist. Profoundly unsatisfying to me, as my experiences often hinged on dialectical tensions and dialogical experiences—those moments that exist between the both/and, rather than the either/or. Cosmopolitanism was the first theory I’d ever read that said you could be BOTH rooted AND rootless; BOTH local AND global; that maybe you would be the most comfortable with others who experienced similar tensions, who live in spaces of in-between-ness. And then the backlash set in. Cosmopolitanism, you were not what I thought you were! Cosmopolitanism, I was informed, really isn’t a theory of both/and. This is a theory of exclusivity, of the ‘class consciousness of frequent travelers’; sure there was a sense of both/and-ness, but only for those privileged enough to be able to engage in voluntary sojourns that inevitably involve Western imperialism and cultural commodification. Why would anyone want to study this concept? I was interrogated about the inherent violence that cosmopolitanism—particularly in its Kantian and previously Greco-Roman Stoic iterations. This is a theory of global citizenship only accessible to those who have the privilege of being citizens in that kind of world. And yet, cosmopolitanism, you continued to proliferate, to grow in breadth and depth. From when I first learned the term in 2006, to the present day (2014), cosmopolitanism theorists flocked to you, across disciplines ranging from sociology and political economy to religious studies and linguistics. Everyone was coming to the party—which also involved directly addressing the critiques of elitism and western imperialism brought with such ferocity by its opponents. Forms of vernacular, non-Western, non-elite and critical cosmopolitanism, which have actually been around since its nascence in places like ancient China in the philosophies of Mo Tzu and Mencius, as well as being promoted by the African philosophy of Maat, are resurfacing in work by such scholars as Pnina Werbner, George Delanty and Walter Mignolo. In intercultural communication, we are, to extend the metaphor, late to your party. Intercultural communication scholars, particularly those who embrace critical and postcolonial approaches, are only now beginning to accept that this cosmopolitanism a term that is growing in strength, rather than waning. As the world shrinks and difference becomes something that can no longer be hidden from (if it ever could), cosmopolitanism in its critical and vernacular forms has reemerged as a theory for our time, which insists not that we should all embrace each others’ many and varied values, but rather that we should understand that we all have values, and all hold those values dear to ourselves and the people and things we love. This kind of dialogic empathy requires hope as an approach to non-binary thinking. Cosmopolitanism is not a project that can be forced upon people; instead, it must be voluntarily embraced as an ethic of care for the world, from those next door to those across the ocean. My colleague Dr. Nilanjana Bardhan and I have recently published a book titled Cultivating Cosmopolitanism for Intercultural Communication: Communicating as Global Citizens, in which we propose cosmopolitanism’s use for our discipline as a space of hopeful dialogue to move from either/or to a space of both/and. Cosmopolitanism, you may not be the answer, but you certainly deserve to be a part of both the discipline the dialogue. Author msobrePosted on February 12, 2014 May 31, 2017 Categories Guest PostsTags both/and, cosmopolitanism, dialogical experiences, global citizenship, global competency, postcolonialism1 Comment on Why Cosmopolitanism? Author Center for Intercultural DialoguePosted on January 17, 2014 May 31, 2017 Categories Applied ICD, Guest PostsTags Daniel Siegel, dialogue, empathy, feeling felt, interpersonal neurobiology, Maria Flora Mangano, Martin Buber, Mona Fishbane, Robyn PenmanLeave a comment on Feeling felt: The heart of the dialogic moment? I am happy to share with you what happened recently in my class, during a lesson dedicated to the genocide of Rwanda and Burundi. I am currently lecturing on dialogue among cultures at St. Peter’s Philosophical-Theological Institute in Viterbo, Italy. One of the students comes from Burundi; his name is Jean. He introduced himself during the first lesson, describing his background and choice of life as a religious. One day outside of class, he mentioned the war in Burundi and the genocide of 1993. In that moment he shared with me and two Italian students what it was like to be a Tutsi. In 2 or 3 minutes he described a few images of the genocide, which he lived through when he was 12 years old; thanks to God, all his family survived. I was shocked by his words and I asked him if he would be able to share his experience with the class, proposing that the students would both listen to his story and see part of the film Hotel Rwanda together. We could organise this special and unforgettable lesson in a couple of hours. Jean prepared a powerpoint and presented the story of his country and the story of his family and relatives during those three terrible days of the genocide. I proposed to the class not to see the entire movie (which is quite long, so we saw only the trailer) but rather to dedicate the majority of the time to Jean’s personal story. I introduced the technical vocabulary, including genocide and shoah, sharing what these terms have meant in the last century and what they mean now. The 16 students come from 9 countries; some of them did not know even where Burundi was. I asked the students to try to create a space of relationship in which they could speak without any fear of offending or to be offended. Jean was extremely clear in explaining the historical background, presenting the political and social aspects underlying the genocide. Then he shared his story with us. I am still speechless, shocked and impressed. It was the first time that one of my students desired to share what the genocide was for him and he prepared everything in detail. One young person who survived the genocide decided to offer his experience as a gift, not in revenge. He was able to share his memories, even if these are still dramatic and negative. Jean said that in African culture the tradition is oral, not written and for this reason it is not possible to ask to him (or others) to write about their experience. He prefers talking over writing about it, but he never did so before this, as he said that the open hurts rest open even after time and sharing. At the end of his time, all the students were so impressed and touched they could not speak. I ask the students to take time and then to try to share with Jean their feelings, also to try to thank him in a real way. I hope it will yet happen. I am happy to share this wonderful experience of dialogue and sharing in class. I hope to be able to publish about it in the future. As scholar, I felt that this should be our way of teaching, especially given the discipline of communication we try to teach (and learn). Let’s go ahead to try to do the best with our students and in research on this issue. I am still convinced that we may try to re-write history through dialogue. I am sharing what happened because it is uncommon to talk about the genocide of Rwanda (and Burundi) for people who survived this. It is still too early, as Jean told me. I consider this moment an important effect of dialogue among cultures, as this student chose to share his life with the class and he prepared the lesson on his own, without any help from me. He chose what to say, also decided not to show any pictures of the genocide and he carefully chose the words to describe those days. He also chose to first present the political and historical conditions as a necessary introduction to the genocide. Afterwards, Jean reported that he felt understood by the class, so probably he was ready to share this moment. In the days since, I have received mails from him and from the others who have expressed their appreciation for that moment. I have the feeling that we built the space for relationship as the basis of dialogue during the course, and that this moment significantly enriched this space. NOTE: See the response prompted by this post, by Robyn Penman. The following note comes from Maria Flora Mangano, one of the participants at the NCA Conference on Intercultural Dialogue in Istanbul in 2009. She told me what she would be doing, and I asked if she would be willing to write about the results for this site. I have just taught a course in a rather unique context. 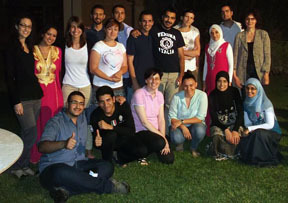 The course was Communication of Scientific Research, offered to students (MSc and PhD) at the Mediterranean Agronomic Institute, located in Bari (in Southern Italy). The Institute is part of the International Centre for Advanced Mediterranean Agronomic Studies, located in Paris. This course was an extraordinary experience: five days, of 8 hours of lessons per day, supplemented by moments of dialogue during the meals and after dinner. All told, a very intense week, with more than 25 students from Masters and PhD courses in various agronomic disciplines. Among the group, only two were Italian, the other students coming from almost 15 countries in the Mediterranean area, from Kosovo to Morocco. The course produced many challenges for me: first of all, the fear to propose content in a non-native language, especially topics related to dialogue as a space of relationship among, beyond and across our cultures and disciplines; then the proposal of building this space during all the week, in class and out, with students who came from countries where there are still conflicts. We discussed in class the attack in Beirut last week, as one student had parents who lived in that zone; the same with the Egyptian students with whom we tried to talk about the 50 deaths in Cairo during the riots in the streets. It was extremely intense to dialogue with students about the value of the other and otherness, starting from European philosophy, which risked appearing far from all their cultures. I tried to introduce the content starting from keywords, as I usually do in my teaching activities, also in Latin and ancient Greek languages, exploring the meaning of the various terms in all of their languages. I proposed that every student introduce her or himself in 10 minutes by using whatever tools they wanted. We spent a lot of time in class analyzing their oral presentations, which were delivered by slide, oral speeches, or music (one student played some songs from his country with a guitar). The issues around scientific research gave me the opportunity to introduce other topics related to the relationship with the other, which are different for every country. I also shared with them the notion of creating a “safe” space of dialogue. One exercise used the short film, Twice upon a time (about bilingualism in Canada). The results were interesting: the students who came from countries close to the European tradition (if we can use this expression), like Turkey or the Balkans (in particular, Macedonia, Kosovo, and Bosnia), appreciated the movie and found it a fitting conclusion to the lesson. But the students from the Maghreb (Morocco, Tunisia, Algeria) and from the Middle East (Egypt, Palestine, Lebanon) did not enjoy it as much. In fact, they found it boring and a bit excessive, as they did not fully appreciate the issues depicted. Ramadam started during the course, which provided another wonderful opportunity for sharing and dialogue. The majority of the students in this course were Muslim, but only about half were observant. Those who were needed to fast (not only avoiding food, but also even water), throughout the day, even though in Southern Italy the summer is hot. I proposed to the students that I would participate in their evening prayer, after dinner, for almost one hour, since it was the only one of the five times dedicated to daily prayer that we might share. They were very happy and surprised, as they told me that it was uncommon for a non-Muslim to join in prayer with them. At the end of the sessions we had ice cream in the garden (the campus is really beautiful), after dinner and after prayer. It was another occasion for interaction among the group members, including some students who were not enrolled in this course. I asked students to send me their feedback and so I have been receiving beautiful notes. I have the feeling that we shared something new, beyond only disciplinary content, as many of them have now told me.